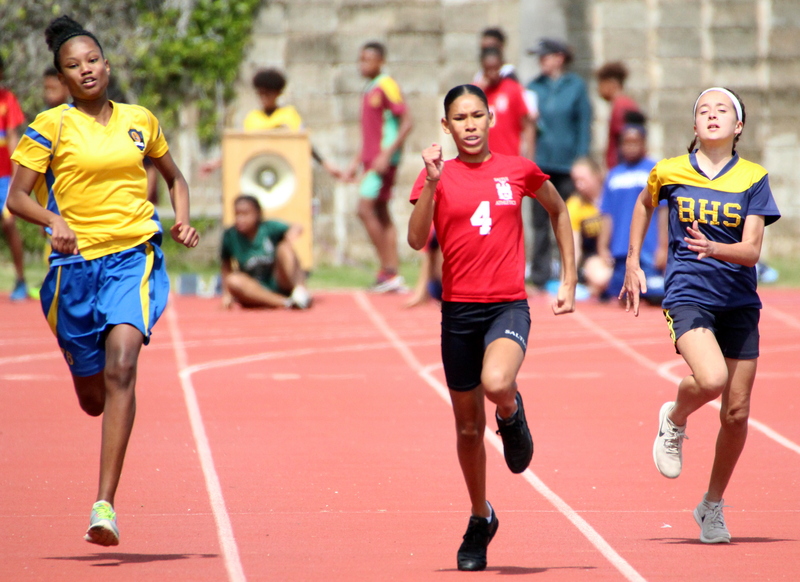 Dellwood Middle School have set themselves up well to defend their crown on the first day of the Bermuda School Sports Federation Middle School Track and Field Championships at the National Sports Center. The reigning champions have opened up an impressive 100 point lead over closest rivals Sandy’s Secondary Middle School. Dellwood led the way winning eight field events. They were led by the Bell twins in the Girls Under 13 category. Kesay Bell was victorious in the Shot Put and Turbo Javelin event while sister Kisaye claimed Silver in the Shot Put and a Bronze in the Turbo Javelin. Eleanor Richmond was also a double winner on the day, the Warwick Academy student claimed top honors in the Girls Over 13 Discus and Turbo Javelin events. There are many points to be won next Tuesday when all of the Track Finals will be held along with the remaining field events. Two records fell by T.N. Tatem Middle School athletes. Sancho Smith was the first to register a New Record when he leapt 1.76m in the Over 13 Boys High Jump, eclipsing the mark of 1.75m set by Kyle Outerbridge from Dellwood Middle School in 2000. Smith looks set to win Champion Boy as he blazed his way as top qualifier in the 400 and 800m races. The T.N. Tatem Over 13 Girls Relay Team also broke a record when the crossed the line in a time of 52.63.